One of the services that I provide for my clients is to build Family Trees for them on either Ancestry.com or FamilySearch.org. Many of my clients have already started their trees on one of these sites and they allow me to edit their trees. I am able to add documents, photographs and stories to their family tree that help to authenticate and illustrate their family history. If you are just starting your family history, you may be wondering which of these sites that I recommend. They both have their advantages and the answer is: “It depends”. Do you believe that you get what you pay for? Or do you believe that things that are really worth having are free? I have been hedging my bets and using both sites as well as several others for my personal genealogy. Ancestry.com Inc., formerly The Generations Network, is a privately held Internet company based in Provo, Utah, United States. The largest for-profit genealogy company in the world, it operates a network of genealogical and historical record websites focused on the United States and nine foreign countries, develops and markets genealogical software, and offers a wide array of genealogical related services. As of December 2013, the company provided access to approximately 12.7 billion records and had 2.14 million paying subscribers. User-generated content included 191 million uploaded photos and more than 16 million uploaded stories. FamilySearch is a genealogy organization operated by The Church of Jesus Christ of Latter-day Saints. It is the largest genealogy organization in the world. FamilySearch maintains a collection of records, resources, and services designed to help people learn more about their family history. FamilySearch gathers, preserves, and shares genealogical records worldwide. It offers free access to its resources and service online at FamilySearch.org, one of the most heavily used genealogy sites on the Internet. In addition, FamilySearch offers personal assistance at more than 4,500 family history centers in 70 countries, including the Family History Library in Salt Lake City, Utah. 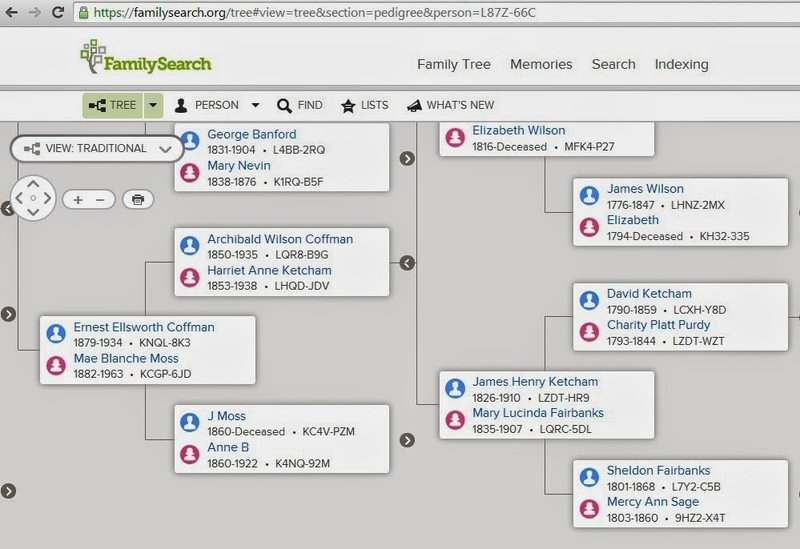 FamilySearch cites as its motivation to provide genealogical information the "beliefs of the LDS Church that families are meant to be central to our lives and that family relationships are intended to continue beyond this life." The optional Family Tree Maker software that allows me to back up and synchronize my online trees to my computer. I get lots of messages from other Ancestry.com users with corrections, additions and complements on the material that I post. I can control the appearance of my trees without interference from other users. Ancestry.com offers a smart phone application that allows you to carry all of your family trees with you on your phone. I can refer to my phone when I am searching for your ancestors and mine in books in the stacks of a genealogy library. This is an example of one of the family trees that I have built on Ancestry.com. This tree shows my ancestor Ernest Ellsworth Coffman in the Pedigree View. Five generations of Coffman ancestors are shown in this view. Let me build or edit a family tree for you! IT IS FREE! I began my digital genealogy with the Personal Ancestral File software for the same reason. FREE! I contributed to the Ancestral File and the Pedigree Resource File in appreciation for the fact that the software and their support services were FREE! The WORLD’S LARGEST GENEALOGY ORGANIZATION has also made sure that all of the data that I contributed has migrated to their new Family Tree. I like the idea of having only one World Family Tree and getting users to collaborate, cooperate and source only one profile for each of my ancestors and only one profile for each of their descendants. Cooperation and collaboration require a little more patience, trust and effort to get the information right for the long term but in the end, I think it is the right thing to do. Placing your genealogy on a free site makes it easier for your family members that are more casual about their interest in family history. The latest news is that Family Search is also offering a smart phone application. I downloaded it to my phone but have not been able to give it a test drive. This is another example of the improvements in FamilySearch which make it increasingly competitive with Ancestry.com. 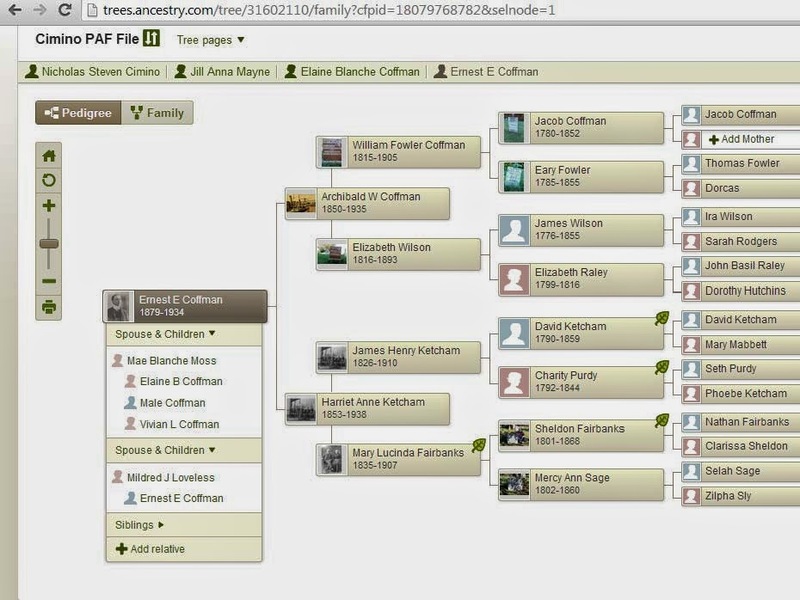 This is a pedigree view of Ernest Ellsworth Coffman on FamilySearch.org which shows a slightly different arrangement but very similar to Ancestry.com. I can build or edit your tree on either or both of these sites. I have invested much more of my time in the last ten years building trees on Ancestry.com. The one Family Tree at FamilySearch.org has only recently been improved to the point where I think it is competitive with the multitude of Family Trees at Ancestry.com. I have recently begun working to improve and update the profiles of my direct ancestors at FamilySearch.org. I have started adding some of the stories and pictures that I have on my trees at Ancestry.com to the FamilySearch Tree. I encourage all of you to start contributing to the unified tree at FamilySearch.org. I have twenty five years of experience expanding and documenting family trees. I can build or improve your tree for you on either site. Some of my clients are starting from scratch. Some of my clients have started a rudimentary online tree but need my help to find the origins of their immigrant or slave ancestors. If you would like to give your family tree a “JUMP START”, please use the contact box in the right hand margin. I welcome all inquiries and can advise you about both free and paid research assistance.